How Good are Sigma's New Cine Lenses? Sigma's Fully Luminous FF High Speed Prime Lenses combine the same high-quality optics and mechanics of their Global Vision still line in a cine-oriented design. 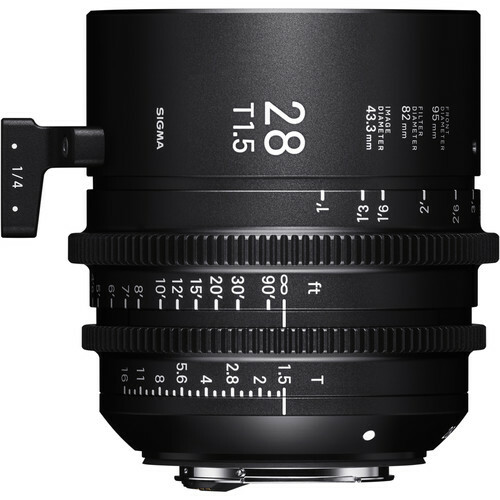 This 28mm Canon EF-mount prime is a wider focal length in the series, offering full-frame sensor coverage, 6-8K resolution, and a T1.5 aperture in a compact, relatively lightweight form; it is also available in Sony E and PL mounts. What sets these lenses apart from the standard Sigma High Speed Primes is fully luminescent markings. When shooting in dim or dark environments, focus pullers and camera operators will be able to easily discern lens markings without resorting to the use of a possibly disruptive light source. A common 95mm front diameter and similar physical attributes across the lens line make it easier and quicker to mount lens accessories such as matte boxes, follow focuses, and lens control motors. The 9-bladed iris produces pleasing out-of-focus bokeh effects and ghosting and flaring have been minimized. Color reproduction is standardized for easier color correction. Each lens in the range offers consistent lens gear positions and 180° of focus barrel rotation. The FF High-Speed Primes also feature a clickless iris with linear markings, dampeners on each gear ring for silent operation, industry-standard 0.8 module gear pitch, and engraved markings for durability.